Police have launched a crackdown on the illegal and dangerous riding of off-road bikes in public places. 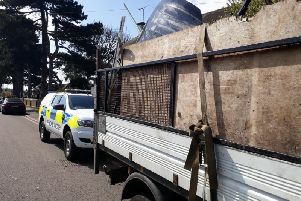 Officers responded to public complaints by taking action with a major operation in Houghton Regis. The force commissioned two off-road police bikes to help target riders responsible for anti-social behaviour. On April 14 and 15, a team of 24 police staff, including an inspector, two sergeants, three response police officers, a vehicle examiner and 15 PCSOs, took to the streets, along with two road policing officers on the specially-enlisted bikes. The initiative, called Operation Meteor, resulted in two arrests in the Parkside area of Houghton Regis. Two stolen bikes were recovered and two Section 59 Notices (warnings) were issued. Officers also visited two addresses, including one in Dunstable, as a direct result of reports from the public on incidents of anti-social and dangerous behaviour. Chief Insp Gavin Hughes-Rowlands said: “We want to reassure the public, through these operations, that we are taking action on their concerns to tackle these offenders and keep our communities safe. “People may not see us acting immediately, but we have to be intelligence-led in our response to this kind of crime and have been working hard behind the scenes to deal with this dangerous and anti-social behaviour. Chief Insp Hughes-Rowlands also urged residents to remain vigilant and report any information they have around off-road biking. He added: “I would encourage people to continue to call 101 with information – not just to tell us what has happened but also who is doing it, what they look like, and what they are wearing. This will help us to target the offenders. “I am reminding those who want to keep up this nuisance behaviour that it won’t be tolerated and they will be caught. Police also carried out an operation in Luton covering Stopsley Common, Wigmore Valley Park and Stockwood Park.